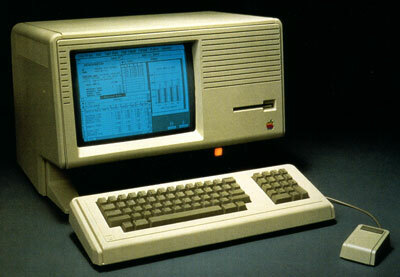 One of the latest additions to the Archeological Media Lab, and one that I’m very proud of, is the Apple Lisa. The Lisa, named after Steve Jobs’ daughter, was introduced in 1983 and it was the first commercially available computer to have a GUI (graphical user interface) – an interface that today we recognize as the standard desktop which contains icons we can point at and click with a mouse. Prior to the Lisa, the most popular computers were the Commodore 64 and the Apple II – both of which used the command-line interface. The Xerox Star, available a few years earlier in 1981, did have a GUI but cost $17, 000. I’m fascinated with the Apple Lisa, then, and the profound influence it’s had not just on how we’ve been interacting with computers for the last 20 years but on how the GUI interface determines (in Foucault’s sense of the archive) what can be thought, written, read. Since I’ve been buying up old computers on ebay, I’ve had the strange and wonderful experience of receiving emails from the owners of these computers, detailing their life in computing. Below is the email I received from the owner of the Apple Lisa – someone who, it turns out, has been working in computing since the 1970s. Thank you Wade! “My history dates back to the very early days of computers, starting just after high school (1969) where I entered a vocational school to learn a new discipline called “Data Processing”. I used keypunch machines, created “drum cards” to program them, wired boards for old IBM 1401 accounting machines, and programmed in BASIC on a teletype machine. Since I live in Minnesota, I remember when my class had a field trip to Control Data. I will never forget the day when we were meeting with some of the senior management there and I asked them if individuals would ever own computers. “Why would they want one?” was his reply. I can remember the first BYTE magazine and discussing home built computers with an engineer I worked with as a COBOL programmer. Since I was first in my class, I was given a job at the Minnesota School Board as a computer operator. I can still remember the pallets of punched cards containing the student gradings that needed to be “gang sorted” on the mechanical sorter, prior to them being feed into the mainframe computer. Or, the precious card deck that when run through the band printer, would play marching songs as the band whizzed by and the beat of the head against the paper made the sound of soldiers marching in perfect step. My career then moved to West Publishing Company, where some of my fellow colleagues began to have an interest in personal computers. I will also remember the defining moment for me when my friend had just purchased a new MITS computer and I got to operate it for the first time. I have never been away from personal computers since that day. I owned one of the first Apple IIc computers, complete with a Sony color TV and cassette tape deck. Hours were spent entering machine code into that computer from the A.P.P.L.E. computer magazine, only to have it run a check-sum report at the end to know I’d keyed in the pages of machine code correctly. Then the excitement of seeing whatever new “program” came to life on the screen. No one shared my fascination, and the only attention I got was from Ralph who was the only one at the Radio Shack store who knew where the one piece of software (on cassette tape) hung in the back of the store. Back in the day, my friends and I would take a road trip from Minneapolis to Dayton Ohio, where we spent the weekend at the annual “Hamvention”. A mecca for amateur radio operators, but also a gathering place for restless computer geeks such as me. There were upwards of 50,000 people at this event and we religiously drove the 17 hours non-stop to get up at the crack of dawn to score the best deals on 5MB hard drives and high-density floppy disks. I introduced the first IBM personal computer at West, when as a challenge, I was told it would be impossible to emulate a $10,000 customized typesetting terminal that was no longer being manufactured. Since a challenge never bothered me, I took it upon myself to acquire a copy of Turbo PASCAL and learned the language on my then new Sears purchased IBM Personal Computer (again with a huge 10MB hard drive – a size mostly unheard of at that time). To everyone’s surprise, but my own, I created the ASTROCOM emulation program, complete with a customized character generator board I located through the computer magazines to display the unique typesetting characters (quad, EM dash and EN space). That was the final straw for the Astrocom terminals and an order was placed for 100 IBM personal computers. I also remember one attorney at West who convinced upper management to buy a new computer from a company called APPLE. Yes, he paid $10,000 for an Apple LISA! In fact, he loved it so much that he recommended West purchase several hundred for their editorial staff. It didn’t happen, luckily. But, I always remembered the Lisa and got the bug to own one if I ever could.